Christmas shopping in Sheffield just got cheaper and easier thanks to festive bus offers announced by Sheffield City Council. The festive bus offer Plus One means anyone with a day, week or month ticket can bring along another person for free on journeys in Sheffield into the city centre after 4.30pm and out of the city centre after 6.30pm on Thursdays and all day on Sundays in December. In Sheffield, Thursdays are for late night shopping, with loads of stores staying open past 5pm, so you have plenty of time to get your shopping fix. From national chains to Steel City independents, Sheffield doesn’t close down at 5pm, in fact some of the most exciting entertainment, shopping and food and drink events happen in the early evening. 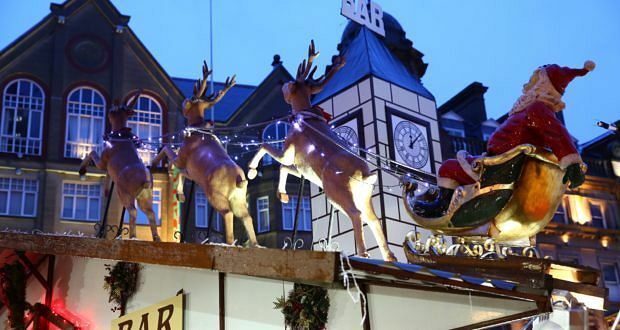 Take advantage of the bus offer and explore Sheffield’s Christmas Markets, which are open until 8pm from Thursday to Saturday and feature more than 50 wooden cabins stretching from the Peace Gardens down to Fargate selling festive treats, gifts, food and drink, and more. Let the bus driver take on designated driver duties and visit The Sleigh Bar, open until 11pm every night. Perfectly placed at the top of Fargate, the heart of the Christmas Markets, Sleigh Bar is ideal for relaxing with a mulled wine after an evening of shopping. Or if you prefer your Christmas drinks to enjoy your Christmas drinks in a tipi, THOR’s Tipi Bar in the Peace Gardens will also be open throughout December. Heading into town with little ones? Visit Santa’s Post Office on Chapel Walk, which is open till 7pm on Thursdays and between 11am and 4pm on weekends and from 18 to 23 December. At Santa’s Post Office, children can enter a magical world and write their letters to the big man before posting them into a special letter box. Once posted, they will be able to watch their letter on an enchanted journey to Lapland. With so much happening after 5pm in Sheffield during the festive season, jump on the bus with a friend and head into the city centre to discover #SheffAfter5.